The U.S. Geological Survey, in cooperation with Chesapeake Bay Program (CBP) partners, routinely reports long-term concentration trends and monthly and annual constituent loads for stream water-quality monitoring stations across the Chesapeake Bay watershed. This report documents flow-adjusted trends in sediment and total nitrogen and phosphorus concentrations for 31 stations in the years 1985–2011 and for 32 stations in the years 2002–2011. Sediment and total nitrogen and phosphorus yields for 65 stations are presented for the years 2006–2011. A combined nontidal water-quality indicator (based on both trends and yields) indicates there are more stations classified as “improving water-quality trend and a low yield” than “degrading water-quality trend and a high yield” for total nitrogen. The same type of 2-way classification for total phosphorus and sediment results in equal numbers of stations in each indicator class. 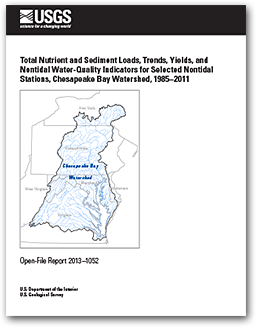 Langland, M.J., Blomquist, J.D., Moyer, D.L., Hyer, K.E., and Chanat, J.G., 2013, Total nutrient and sediment loads, trends, yields, and nontidal water-quality indicators for selected nontidal stations, Chesapeake Bay Watershed, 1985–2011: U.S. Geological Survey Open-File Report 2013–1052, 51 p., available only at http://pubs.usgs.gov/of/2013/1052/.